Nestlé Waters is facing backlash over a new ad campaign aimed to boost its public image by highlighting its free water bottle shipments to Flint. The campaign — which features a radio and TV spot — comes as the company faces ongoing criticism for siphoning millions of gallons of Michigan ground water at a bargain-basement price. Water rights activists and others called the campaign "exploitive" and "criminal" on social media in the days following its Sunday debut. Meeko Williams with Hydrate Detroit told Deadline he became "violently ill" when he first saw one of the ads on television. The 30-second TV spot opens at the company's Ice Mountain bottling facility in Stanwood, Mich. — not far from the Osceola County wells where it pumps more than 1 million gallons per day for a $200 fee to the state. 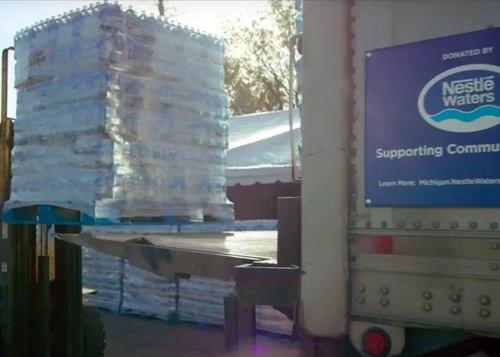 A Nestlé truck is shown taking cases of water to Flint, part of what the ad says is a weekly shipment of 100,000 free bottles. "Some people had forgotten about Flint, but Nestlé Waters never did," a member of a local church says as Flint residents are shown picking up the cases. "In Flint, we haven't given up because we have friends like Nestlé Waters." The campaign has backfired spectacularly. "Everytime I see that damn Nestle commercial about Flint I see red," former Democratic gubernatorial candidate and Farmington Hills businessman William Cobbs said on Facebook. He also points out that the shipment is pretty meager when you consider that about 100,000 people live in Flint. "I don't know any human being that can make it on less than one bottle of water per week," he said. Flint water activist and mother Ariana Hawk called the narrator a sellout in her own Facebook post. Detroit activist and radio show host Elena Herrada suggests protesting outside a TV station airing the ad. Some call for a Nestlé boycott. "They think delivering water is enough for people who have lead in their bodies," Williams said of the ad. "Water is human right. These are the same people who said water is not a human right, it's a commodity." Nestle Waters responded to the criticism late Friday. "We understand water is an emotional issue, and we appreciate the passion people everywhere have about it," a statement from a spokesperson said. The company added that it had "engaged a number of community members and stakeholders in the process of creating the ads." This spring, Nestlé announced it would continue sending weekly water bottle shipments to Flint as its lucrative arrangement with the state became the subject of renewed scrutiny. In April, Michigan environmental officials granted Nestlé's request to pump an additional 150 gallons a minute from the state's water table. The outrage compounded when, three days later, Gov. Rick Snyder said he'd end state-sponsored water bottle distribution in the city, where, though the water quality has improved, many people still fear drinking from their taps.